LOUISVILLE, Ky. -- Thoroughbred racing at its best. Thoroughbred racing at its worst. In a jarring matter of moments, the Kentucky Derby gave us both. It gave us an overpowering tour de force from Big Brown, stomping the competition despite inexperience and unfavorable post position. And it gave us a fatal injury after the race, when filly Eight Belles followed a sensational effort of her own to finish second by fracturing both ankles, falling to the track and being euthanized on the spot. Brilliance and brittleness. Triumph and tragedy. A superstar performance and a ghastly postscript. It was an evening of violent mood swings at Churchill Downs. It's reminiscint of Babaro after he got injured (Preakness instead of KD) but instead of months of rehab with a sad ending, this ending happened on the same day. The Louisville stations covered it in more detail after the network coverage ended. They interviewed the trainer of Eight Belles and the track doctor. Eight Belles was doing fine just after the race. Then for some unknown reason both of her front ankles snapped. No one seems to have an explanation as to why or how it happened. Just one of those freak things. 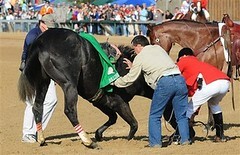 The doctor said that in order to be able to heal a broken ankle, the horse has to be able to stand on the other three. It also had to be able to stand in order to get it into the horse ambulance so they could go to the equine hospital. With two broken ankles, there was just no way she could stand up & heal. Plus, one of those breaks had broken the skin and that cut had been exposed to the dirt & such on the track. The likelihood for infection in that wound was very high. He said that it is nearly impossible to fight off that kind of infection without two broken ankles. To top all of that off the horse was in EXTREME pain. Euthanasia was the only humane option. It's sad when things like this happen. PETA is upset now; they will probably try to ban horse racing. But would they care if the jockey died? Somehow, I doubt it. Well I think there may have been something wrong that we were not told about. There is no harm in thier looking into the case. I'm not for banning horse racing, but if there was any hanky panky going on, I think it should be brought out into the open. Terrible, terrible thing to have happened - no one wishes that. Thanks goodness they acted swiftly.